Technics aside, a perfect photograph usually involves both, an absorbing subject matter and an image that leaves an imprint as if it were a memory of one’s own. Take these qualities and wrap them around India’s filmi phenomena, turn the roll into a series and what you have is the stuff that dreams are made of. Bollywood dreams, to be (slightly inaccurately) exact. 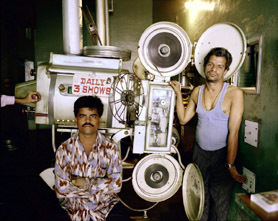 Jonathan Torgovnik‘s extensive travels throughout India in the early 90s led him to rural India’s nomadic cinema halls and the masala movie sets of Chennai and Mumbai. On the way he managed to create a completely riveting contribution to the study of Indian cinema in the form of Bollywood Dreams (Phaidon Press, 2003). This (unbelievably perfect coffee table) book feels like a deeply personal photo essay as well as a tribute to Indian cinema’s grass roots. All seen through the eyes of a former combat-photographer for the Israeli army. Two 19-year-olds were arrested May 10 and charged with vandalising a partially completed Hindu temple in Maple Grove, MN, on April 5. It’s pretty damned recent. 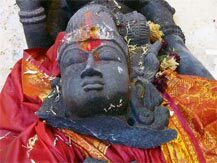 The scoop is that vandals punctured walls and broke into a Hindu temple, ruined some Hindu Gods and left. Property destruction is never that focussed unless it’s a deliberate attempt to intimidate. Nearby Churches went untouched. …the longer you stay [in places like Iraq], the more you’re enforcing these tribal differences and creating a resistance, which obviously, on the one hand, someone like me does support; on the other hand, you support the resistance, but you may not support the vision that they are fighting for. And I keep saying, you know, I’m doomed to fight on the side of people that have no space for me in their social imagination, and I would probably be the first person that was strung up if they won. But the point is that they are the ones that are resisting on the ground, and they have to be supported, because what is happening is unbelievable. So, it seems she’d rather cast her lot with the barbarians who’d “string her up” than implicitly support the Western hegemony responsible for her material well being, freedom of speech and physical security. So be it. After almost an hour of traffic, IÂ’m nearing work, though IÂ’m furious that this succession of delays means that by the time I get there, it will be too late to get fresh breakfast. Now that IÂ’m off donuts, thereÂ’s not much left in the Â“continentalÂ” spread that I feel like eating. WasnÂ’t there an amazing indie coffee place around here? I remember grabbing something hurriedly before my pre-wedding mani/pedi a few days agoÂ…I hadnÂ’t expected much, but after my first sip of perfectly brewed espresso, I was a believer. The place had a cutesy nameÂ…there it was: The Bean Counter. Unfortunately, parking was not allowed in front of it. Fortunately, I snagged a coveted “zone two” spot right around the corner. Go me. I slowly turned and found a very well-dressed older black man smiling at me. In my peripheral vision I noted a gleaming black town car, illegally parked. I started stammering, I had been in my own little world before he yanked me out of it. My goodness I was an idiot first thing in the morning. Fine, second thing, too. I went back to the menu but the only thing which appealed contained nutellla, which IÂ’m staying away from, since IÂ’m weaning myself from sugar. Just coffee then, I guess. I went in and walked all the way to the back of the narrow space, to the register. Â“How many shots are in a large?Â” I asked, slightly ashamed that I knew exactly how to order my desired drink in Startwat lingo. I didnÂ’t want to betray my shameful secret, so dumb questions were in order. Â“Three.Â” She had a rather thick accent I couldnÂ’t place. Madre de Dios, thatÂ’s a lot. I remembered my junior year at Davis, when I went to Roma off A street right before a final exam and ordered a triple shot drink. I spent the majority of our two hour test period puking my brains out, leaving me a whopping 20 minutes to fill a blue book with my suddenly very shaky handwriting. Thank goodness it was just poli-sci. Take a deep breath. This is not a political post. It’s another post about music. Indo-Pak Coalition is a current trio project that includes Rudresh Mahanthappa on saxophone, Rez Abbasi on guitar, and Dan Weiss on tabla. It’s just one of a number of fascinating, adventurous collaborations taking place on the creative-music scene these days. Along with his longtime collaborator, fellow-desi and piano genius Vijay Iyer, Rudresh is a regular on this scene and his work, whether in straight-ahead jazz or cross-genre collaborations, never fails to fascinate. He’s got a wonderful tone and attack that place him in the Coltrane legacy, and he’s done very thoughtful work that injects classical Indian concepts and themes into forward-looking contemporary jazz. 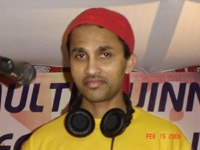 Read more about him here, and about Pakistani-American guitarist Abbasi here. Indo-Pak’s new suite “Apti” premieres tomorrow night, 5/31, at Joe’s Pub in NYC, and I encourage local Mutineers to join me there. I was saddened hear about the death of Desmond Dekker, one of the pioneers of the original Jamaican ska music scene (hear some of his music at Myspace). Ska, which Dekker and a handful of others invented in the early 1960s, is a kind of double-speed form of calypso that is generally upbeat and celebratory. It was a pop fad in Jamaica in the early 1960s that was reborn as a kind of multicultural pastiche in England with bands like Madness and The Specials in the late 1970s. Those bands were self-consciously racially integrated — often with black lead singers and white bandmates — and they were hugely commercially successful. The lead record label in this second wave of ska bands was 2 Tone Records, which got its name from its distinctive checkered logo, though “two tone” also clearly referred to the label’s multicultural, racially inclusive vibe. I was a big fan of this type of music in high school and college, though I grew up during the ‘third wave’ of ska — after it had been reborn yet again as a kind of offshoot of American punk rock. 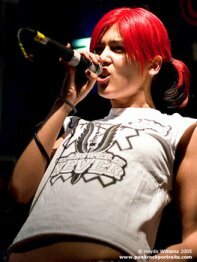 As I bounced along to Operation Ivy in high school, I wondered: what about desi ska? The upbeat rhythm you find in The Specials (or earlier, in Desmond Dekker himself) is also key in Bhangra, and the two genres seem almost made for each other. ArtWallah ’06 is now less than a month away in Los Angeles. SM readers have heard me sing the praises of this organization and its annual festival before. I appreciate what they do and what they are about so much that I have been wallahnteering to help run the festival for the past three years. This year I decided to retire and actually cool out to all the artists and just enjoy myself…or so I thought. Just when I thought I was out, they pull me back in. I’m the new “CashWallah.” I will leave it to your imaginations what that job entails. Last year I decided to entice SM readers to come out to the festival with a little multimedia tour which made it pretty obvious why anyone within a hundred miles of L.A. (at least) should show up. I hyperlinked to some new musicians, artists, dancers etc. This year the ArtWallah Press Team has saved me the trouble and made a detailed program FULL of interesting hyperlinks to artists many of you have never heard of. It took me an hour to click through them all and appreciate what I saw. It was an hour well spent. …this year’s ArtWallah festival [at the Japanese American Cultural & Community Center] will present the works of over 40 artists through dance, film, literature, music, spoken word, theater, and visual arts – showcasing the personal, political, and cultural celebrations and struggles of the South Asian diaspora (Bangladesh, Bhutan, India, the Maldives, Nepal, Pakistan and Sri Lanka). Click on “Continued” below for a quick lick. Arnold: "Must be a cultural thing"
Recently Gov. 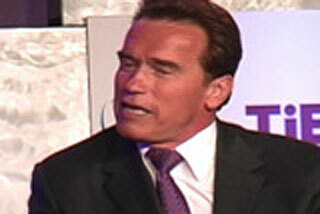 Arnold Schwarzenegger of California spoke at the 2006 TiEcon conference in front of a large group representing the Indian American business and entrepreneurial community. The conference was held in Silicon Valley and dealt mostly with the intersection of California, business, and Indian Americans. A mash-up clip featuring the highlights of his talk are available on the internet. It is worth seeing (scroll down just a bit on the linked page) especially for the zinger that Schwarzenegger unleashes about a quarter way through the clip when he notices that all of his co-panelists are men. What’s up with that? Over the tipline we are often asked by Indians living in India why we (as individuals) don’t blog more about certain Indian issues (especially those dominating the Indian media). The simple answer is that you most likely wouldn’t want to read what we have to say about many Indian issues. We aren’t Indian nationals, we all reside in North America, and we are all U.S citizens (except for our current guest blogger who runs our Canadian operations). This means that our opinions, at best, would provide some with a broader perspective on a given topic, and at worst could come across as ignorant or ill-informed. There are better places to read about Indian issues if that is what you are looking for. And yet, those of us who write for SM have definitely felt some resentment at times from parts of the Indian blogosphere, both when we blog an “Indian issue,” and when we don’t. I know that the current hot topic in the Indian media is the battle over a quota system in Indian universities. I wasn’t going to write a post about it because the Indian educational system doesn’t affect me in any way. However, my mom mentioned the debate to me over the phone and we got to discussing it. I realized how similar and how different the debate in India is as compared to the affirmative action debate in the U.S. Being a graduate of the University of Michigan, the central battlefield for affirmative action in the U.S., I have some definite opinions on the subject and am generally in favor of affirmative action and the type of educational environment it leads to when implemented and executed properly. Countless other Indian medical workers who have gone on strike this week feel much the same as Sen, which is why India’s sudden battle over affirmative action makes the ongoing divide in the U.S. over racial preferences seem tame by comparison. Public hospitals across the country have shut their doors to all but emergency services; private hospitals in some Delhi suburbs are following suit; trade unions have called for a morning of civil disobedience; and students at India’s elite business schools are meeting to plan their own protests. In spite of the disruption, the government has sworn that it will not back down, regardless of who resigns or how many protest. Increased quotas, it claims, are the only way to foster social equality at the institutions that are driving the Indian economy forward.